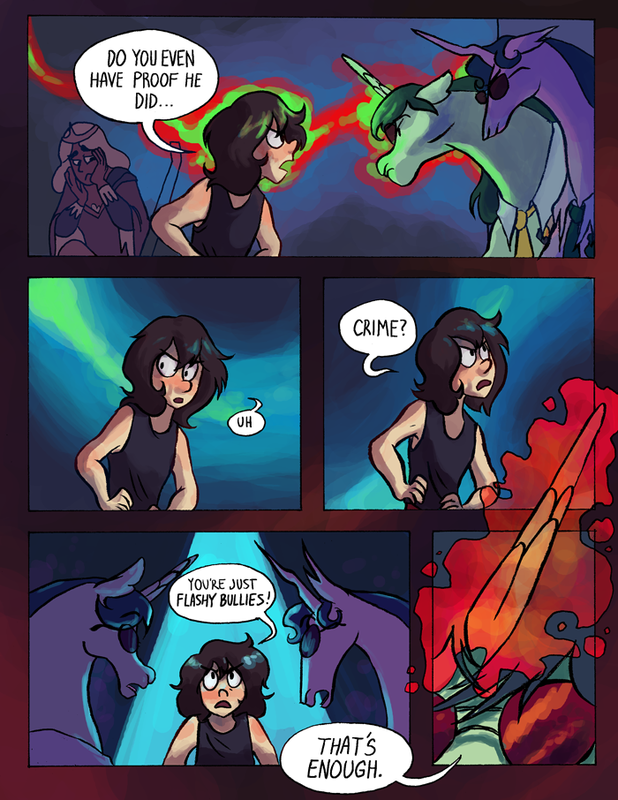 the unicorn cops are my new favorite part of the comic, and I loved everything else before. the colors on the page and panel backgrounds for this page are really great too. Thanks! I find myself using these color combos a lot lately. Oh god this is awesome. The unicorns with sunglasses remind me of the radical lands in Dr. McNinja. What's going to happen next???? Gosh! The most manly and terrifying names in the whole unicorn police force. Commissioner Spangle is a lady. But yes those are very imposing names. They make criminals tremble in their crime boots. I like how she's just sorta knee-jerkingy defending him (she doesn't even know what he's been charged with!). For all she knows, he's a unicorn-mass-muderer! Daisy Snarlbear saying "did crime" is the greatest thing I've seen all day.